The Teamwork Projects online project management software suite is the brainchild of Peter Coppinger and Daniel Mackey, two web developers who found that in spite of their considerable traditional project management skills, it was becoming difficult to manage their success. Deciding they needed task management software to regulate their workload, Coppinger and Mackey tried several of the leading packages and found them wanting in various areas. Fate intervened and provided them with a customer looking for online project management software. Thus they were able to create a software platform that is easy to use and generic enough to be used by any industry. Teamwork Projects eliminates the confusion of email chains by putting the things each team needs to know in one place; not scattered around in multiple in-boxes. Posting or accessing information is easy from a computer or with an iPhone, iPad, or Android. Teamwork Projects provides time-tracking tools, accountability tools, and finely tuned user access controls. 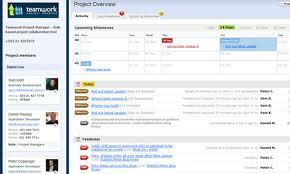 The dashboard gives an overview of all projects, and allows switching between projects with ease. The activity tracker keeps members up to date on all tasks and task lists, monitors upcoming milestones, informs of new comments or messages, and makes it easy to export information in other formats. The smart tabs feature automatically creates tabs with content unique to a given user. Project visualization is built in with automatic Gantt charts, easy visualization and editing of dependencies, drag-n-drop editing of milestones and task assignments, as well as automatic calculation and graphical display of task list progress. Contact TechnologyAdvice to get started with a free trial of Teamwork’s task management software. Compare TeamworkPM with other cloud-based project management software using our Project Management Product Selection tool. Learn everything you need to know about Teamwork Projects. Our experts will reach out to you shortly.